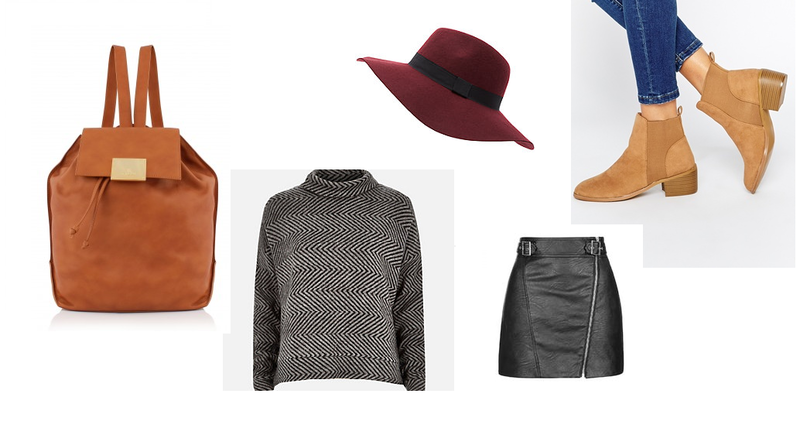 Another autumn wishlist! I'm loving the autumn trends right now. I love big chunky jumpers and boots. I haven't bought any clothes for a few weeks as were saving up to move out and have been buying bits for the new place. I have been window shopping and i've been browsing online and thought i'd but together this wishlist. I love this jumper from River Island, its a lovely grey and black knit and such a unique shape, I don't have anything like this in my wardrobe. I love this PU leather skirt from Topshop, its a gorgeous biker style with the silver buckle. I recently bought a PU leather skirt from Primark and I think it's a must have this A/W it just goes with so many things. I love this back pack, isn't it gorgeous, it's Vivienne Westwood from Garment Quarter they have some really lovely designer pieces. I love the tan colour, I think tan is a perfect autumn colour, like the leaves. I alway wear tan in the autumn, I picked out these gorgeous boots from Daisy Street at Asos. They are a lovely suede style, they have a cowboy vibe about them. I love them and think they would go really well with the backpack. Finally another hat, I've bought myself a couple of hats this month, I always wear big hats in the Autumn . They keep the chill from your ears and are so on trend right now. I love this Burgundy colour, Its my favourite colour for the Autumn. Stylist are giving one of their lucky readers the chance to win £500 at Garmet Quarter, read more about it here and find out how to enter. *this post is in collaboration with Garment Quarter .